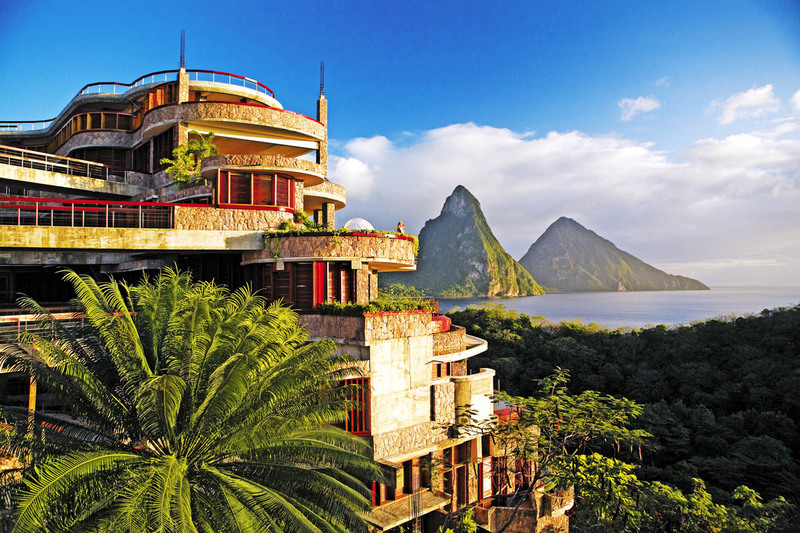 Jade Mountain really is the most extraordinary and daring multi award winning luxury 5 star hotel in the Caribbean. 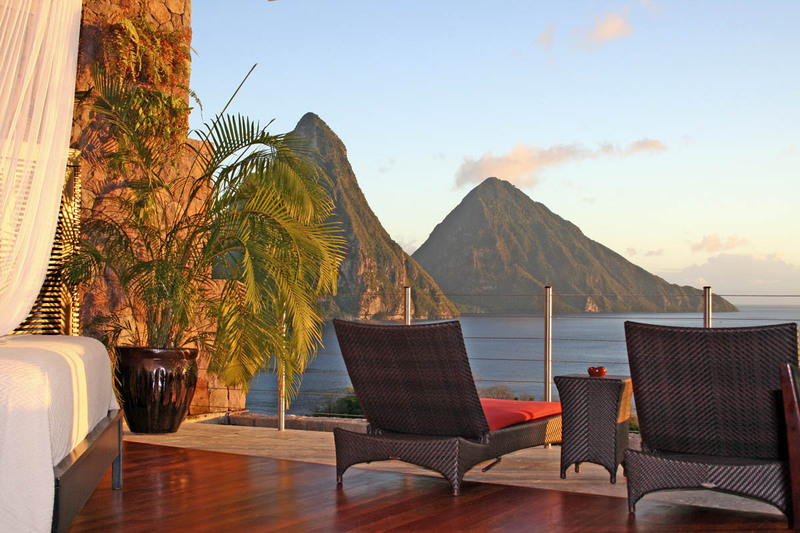 Nick Troubetzkoy, architect and owner has been steadfast with his principles and philosophy of ensuring his character full creations remain in harmony with the natural elements of the Caribbean. 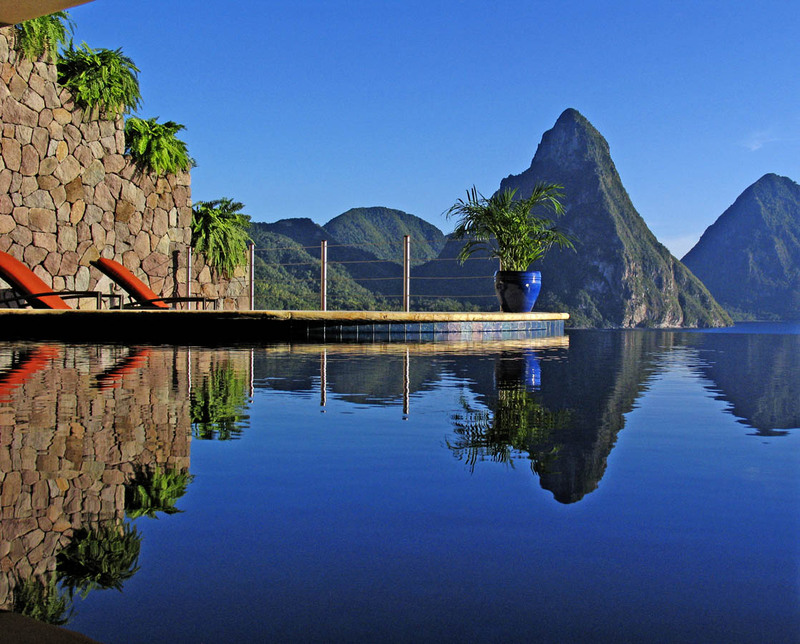 This distinctive 5 star hotel in St Lucia has stone faced columns, individual staircases, fish ponds and the most magnificent hard wood form Guyana interlace the amazing sanctuaries, roof top bar-restaurant and celestial terrace especially good for quiet moments spent under inky black skies and a twinkling galaxy which makes you feel that you are on top of the world. 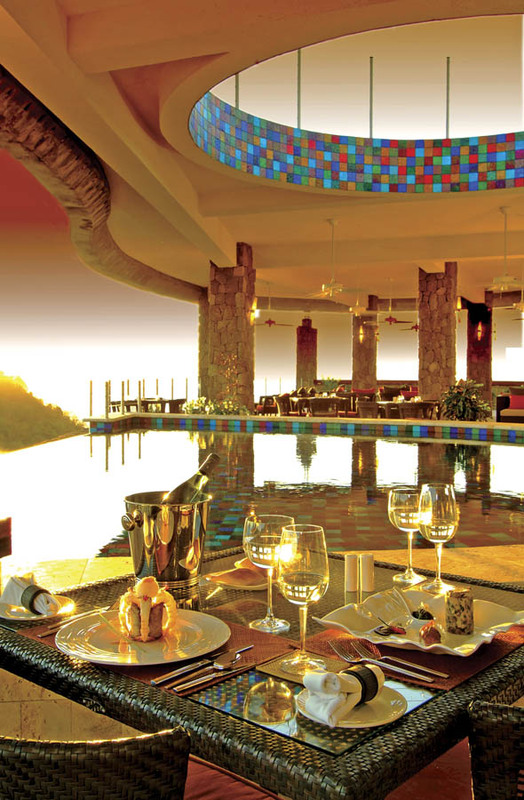 Phenomenal menus inspired by seasonal variation and exquisite presentation of fabulous fusion food which can be taken in several private dining locations or in your sanctuary Jade also has an art gallery, boutique, superb spa and fitness room to relax in. 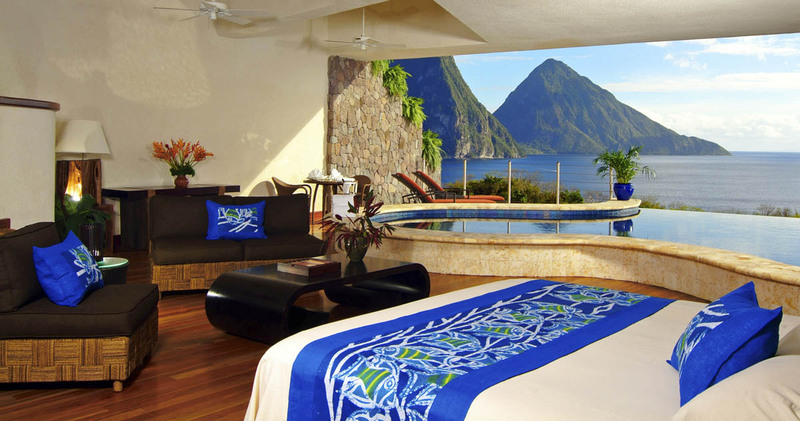 All the facilities of sister, award winning Anse Chastenet’s facilities are available to guests at Jade Mountain as well as the 600-foot yellow sand beach frontage. Internet connections and TV are available in the reception area. 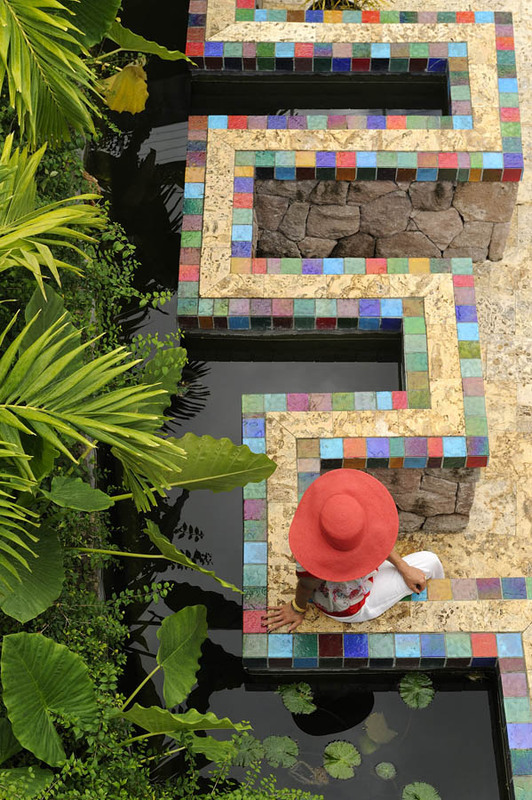 Fernando Tabora the renowned landscape architect was awarded several accolades in his home country of Venezuela and is still consulted today on how to maintain and enhance this tropical paradise. 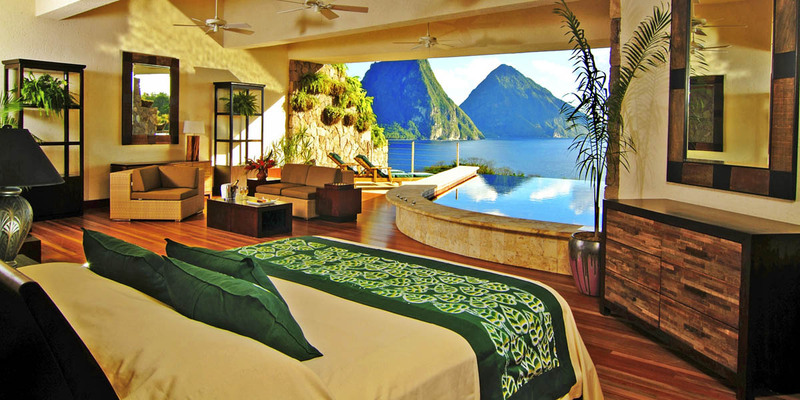 The luxury 5 star accommodation at Jade Mountain are all sanctuaries and are spacious and airy with 15ft high ceilings and open plan living and sleeping spaces. 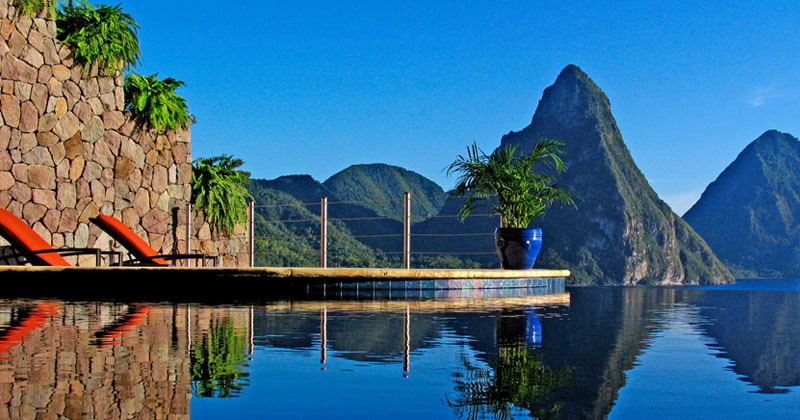 All of the infinity pool sanctuaries have the most amazing views over the world heritage site where the famous Pitons are situated as well as the sparkling Caribbean Sea and miles of iridescent bougainvillea trailing over the darker mountainside high lighting the strong colours orange purple, lavender and pink of this magnificent bush. Interiors are finished with coral plaster from Barbados, removable Jalousie louvers, coral tiles from neighbouring islands. More than 20 different types of wood have been used such as Purple Greenheart, Locust, Snakewood to name a few. Spacious bathrooms with shower towers, massage jets, rainfall showerhead, coral tile floors, porcelain washbowls and fine brushed stainless and nickel plated fittings. 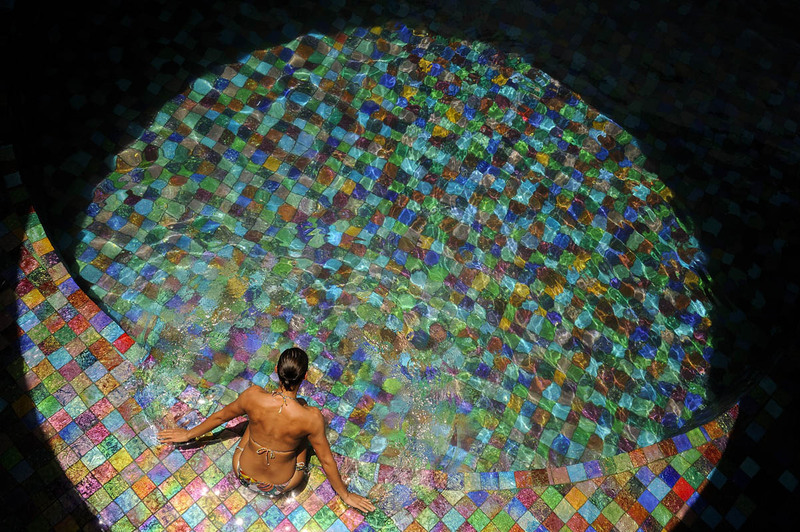 Huge whirlpool tubs made for 2 with strategically placed point massage heads and a ‘chroma-therapy’ color wheel – based on the theory that colors affect biorhythms and life equilibrium. 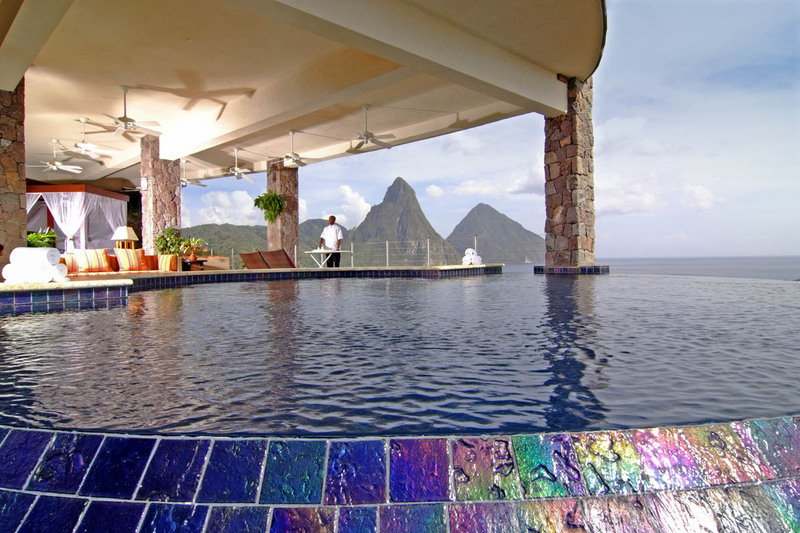 Jades most unique feature is the infinity pools which are from 4-900 sq feet are situated in the Galaxy, Sun, Moon and Star categories. 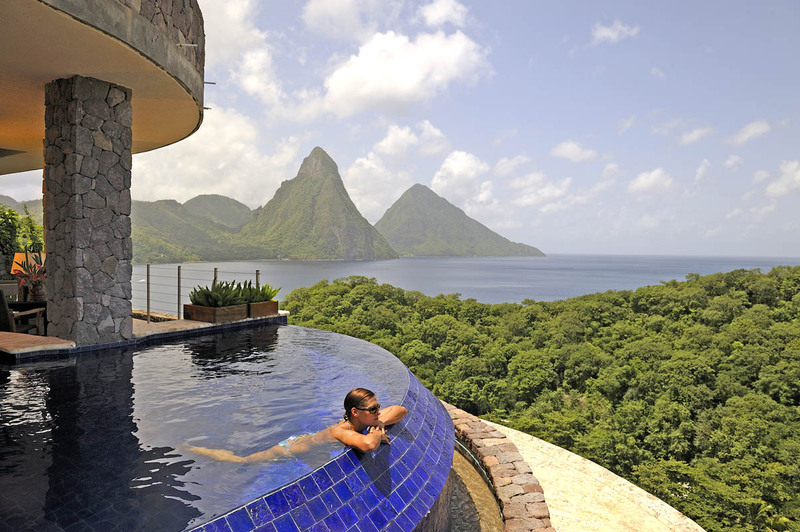 These private pools and lounging areas increase to a swimming area of 4-6 foot deep. 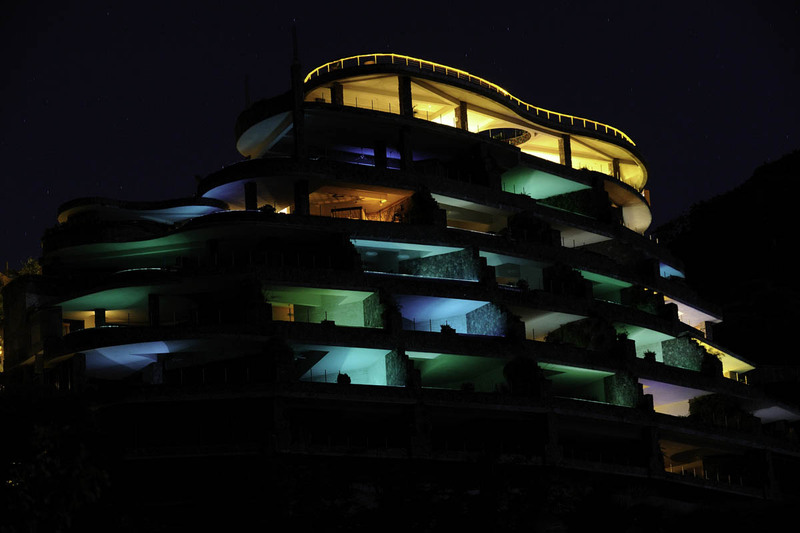 The individually designed glass like tiles are like nothing else you will have seen, each pool is a different colour and is lit at night with fibre optics that can be controlled by the guest. Private pools, fridge, tea/coffee maker, hair dryer, shower tower which features a rain shower and 6 body sprays, Frette bathrobes local bath preparations, open floor design allow the bathrooms to become part of the sanctuary experience, chromatherapy whirlpool tubs – Sky only, iron and ironing board, day beds, electronic call button to contact the service team at any time. 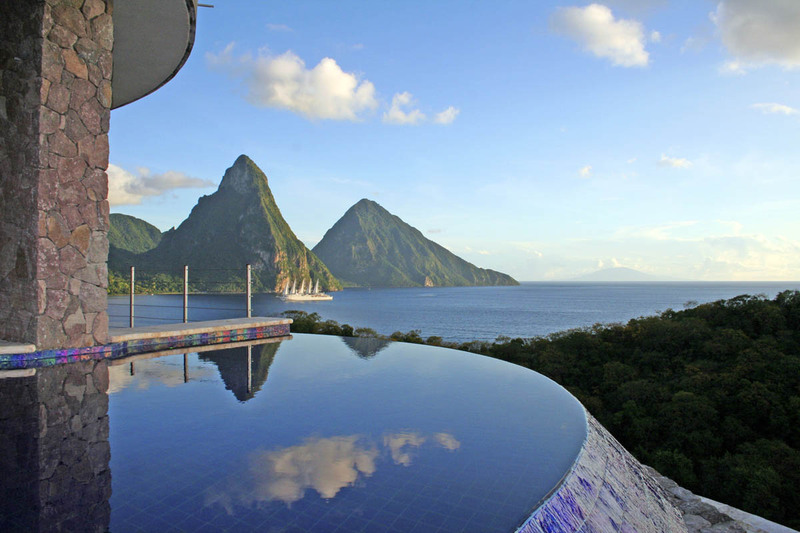 There are no television, radio or telephone in the infinity pool sanctuaries and sky suites in keeping with the overall resort experience. 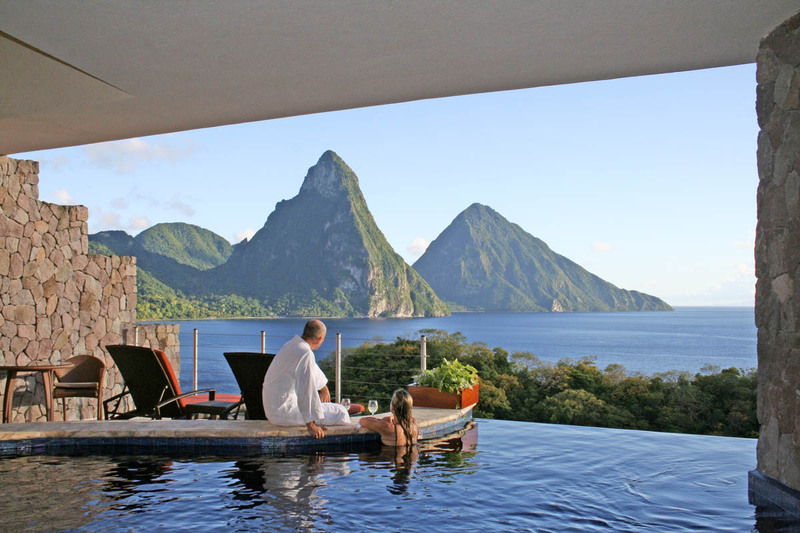 Drenched in exotic beauty and erupting with flavor Jade Mountain nourishes both the body and soul. 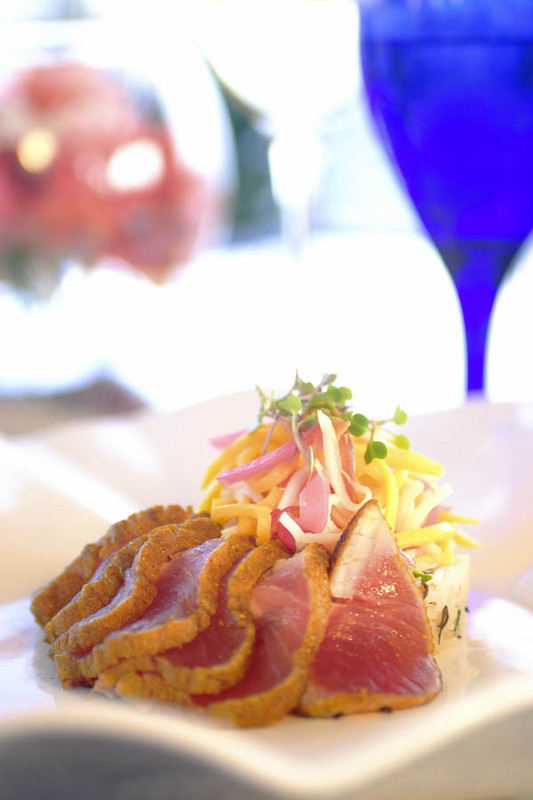 It’s “Jade Cuisine” created by James Beard award winner, Chef Allen Susser, is a brave new world of tropical flavors. His cuisine is exotic and delicious, with a history of fusion it its fabric. 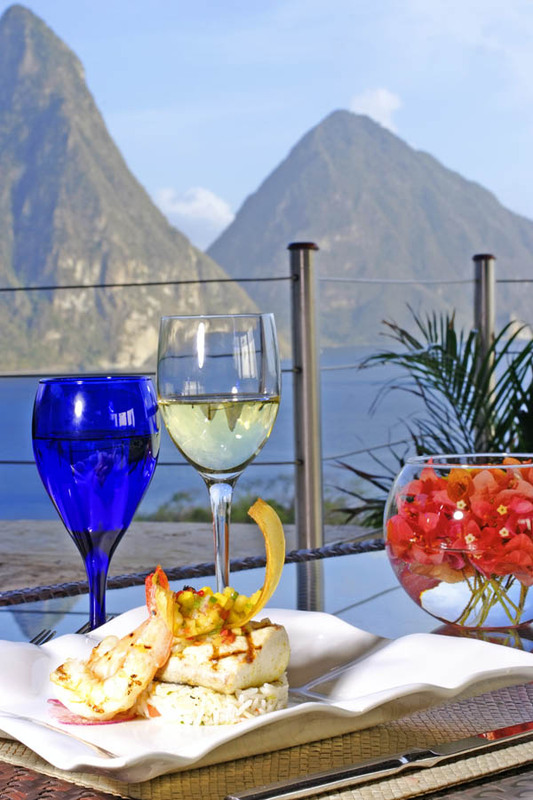 St.Lucia Dining taken to new heights, in many ways. Every meal, any meal, any time! 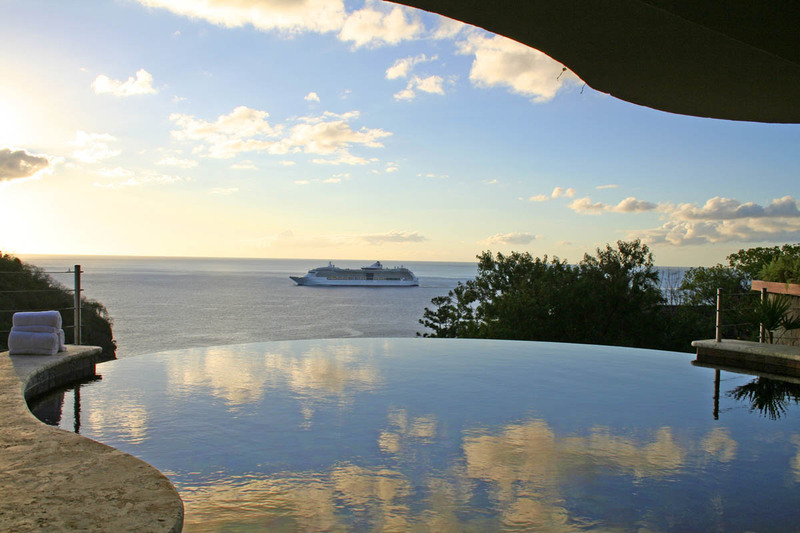 Let us not disturb you, but help you to fulfill your needs and wants in your own personal sanctuary. 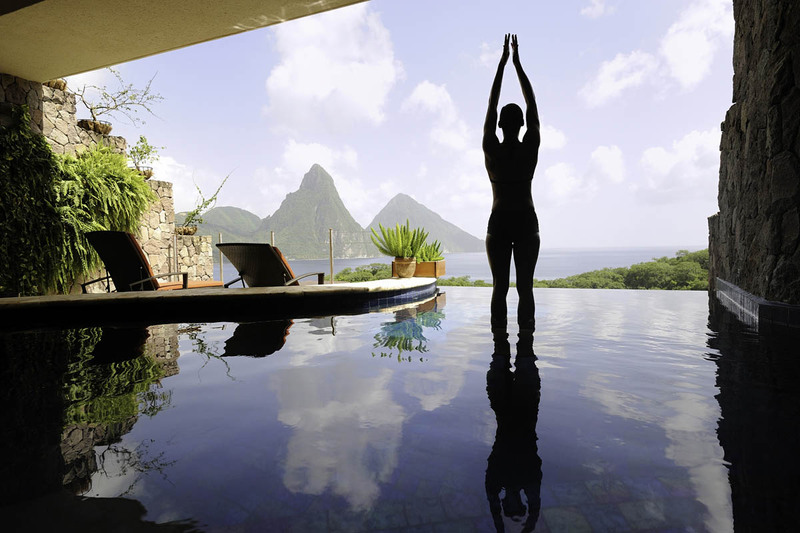 We cater to the mind, body, spirit and senses of our guests. 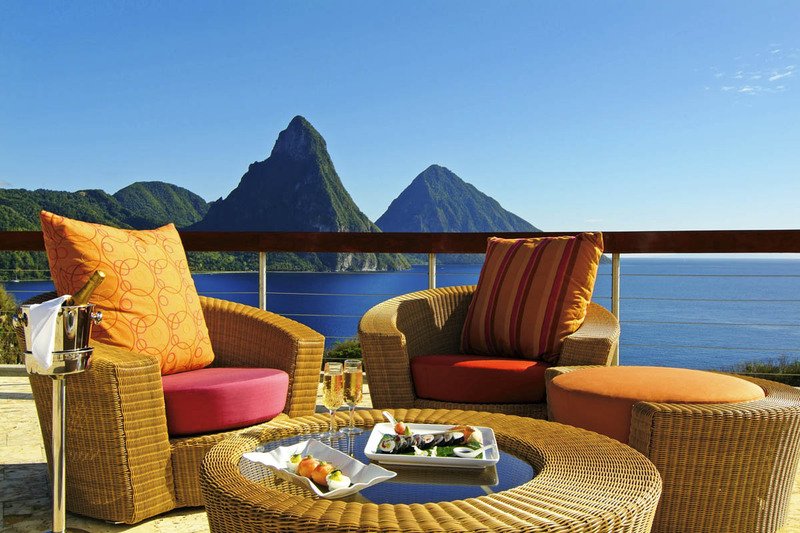 The service itself always reflects a sense of warm professionalism and genuine hospitality. 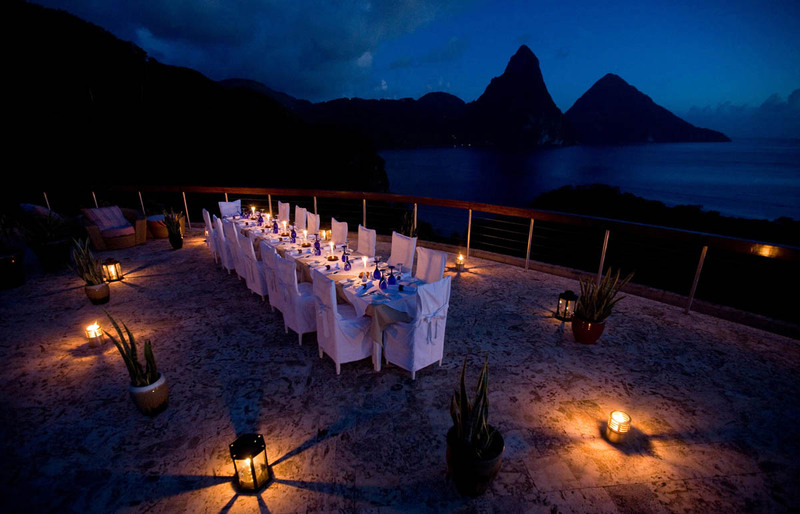 Plus, the culinary team has created some very special menus for those extra special occasions. 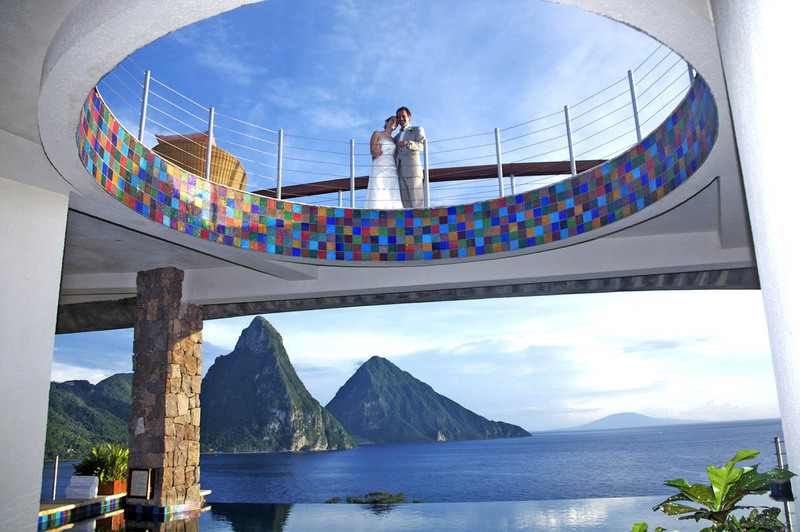 A stunning location, a world class 5 star hotel in St Lucia, Jade’s luxury wedding service is a celebration of life and love and offers incomparable packages for this. 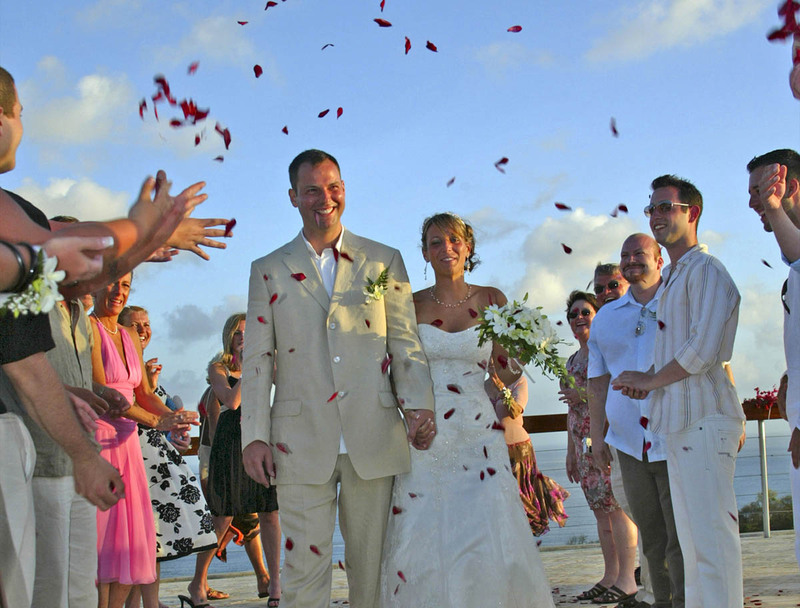 Your very special day is held in unforgettable private surroundings and the ultimate in service. All the paperwork can be sorted out before arrival leaving you simple to select a location of your choice. 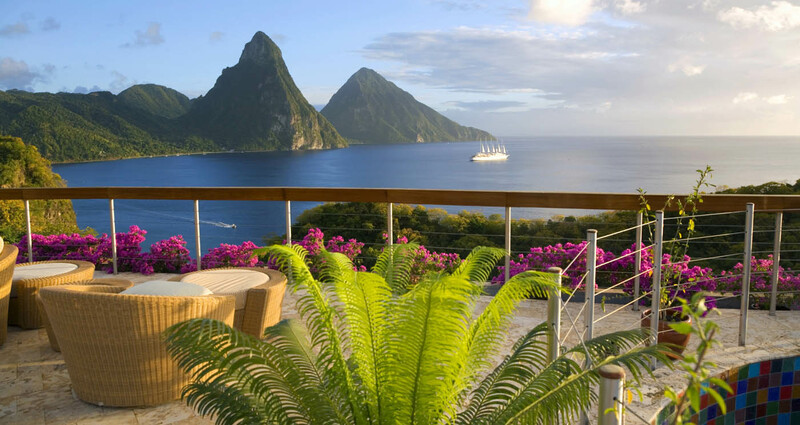 Honeymoon and romance packages are considered and inspired for those looking for special moments that will not be forgotten for many years.